My husband told me the other day that he thinks the front porch is the new mantel. I laughed out loud because I knew exactly what he meant! I used to LOVE decorating my mantel and would change it up at least once a month. And while I still appreciate a good mantelscape, I have to agree with the hubs that in 2014 the porch was the new mantel! 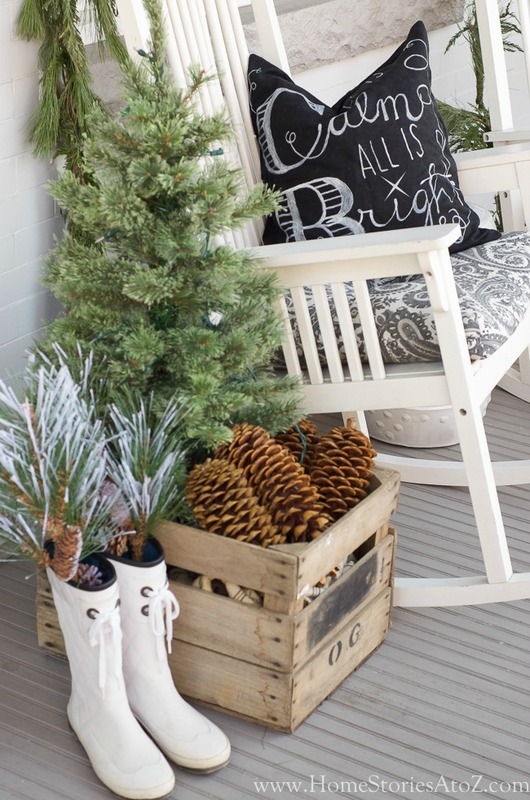 I just love to create different looks for my porch. 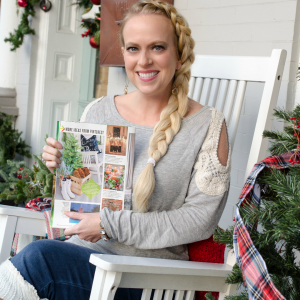 Today I wanted to share this year’s Christmas porch decorating ideas with you to show how you can create a lovely porch using natural elements. I just don’t think you can beat the look of fresh garlands at Christmastime! 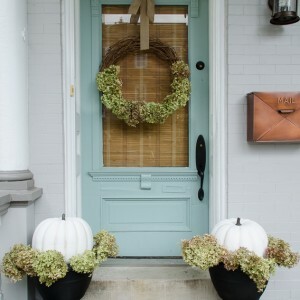 I love using natural garlands from Lowe’s to decorate the porch. Yes, they are a splurge for sure, but they bring me so much joy that I think they are worth it and look so much better than faux garlands. You can buy a 20ft garland at my Lowe’s for around $15. I think I used 4 of them for the porch. Lining the porch steps are my DIY Oversized Ornaments. If you missed that post, click the link to see how I created them! You’ll never guess how easy they are to make! 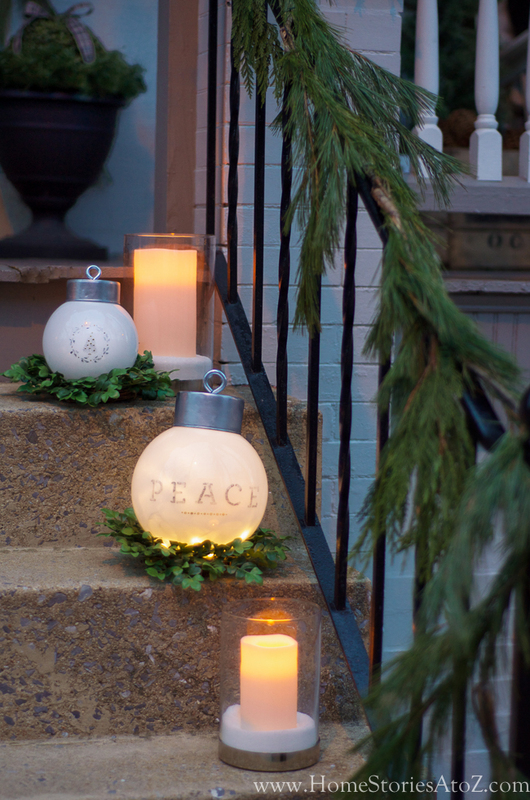 My ornaments and lanterns are a lovely greeting at night. They aren’t practical to keep outside all season long due to the elements but they do look lovely! I keep them inside on my mudroom shelf when not in use out here. On my rocking chair is my Pottery Barn Knockoff Chalkboard Art Pillow, and it looks perfect out here. 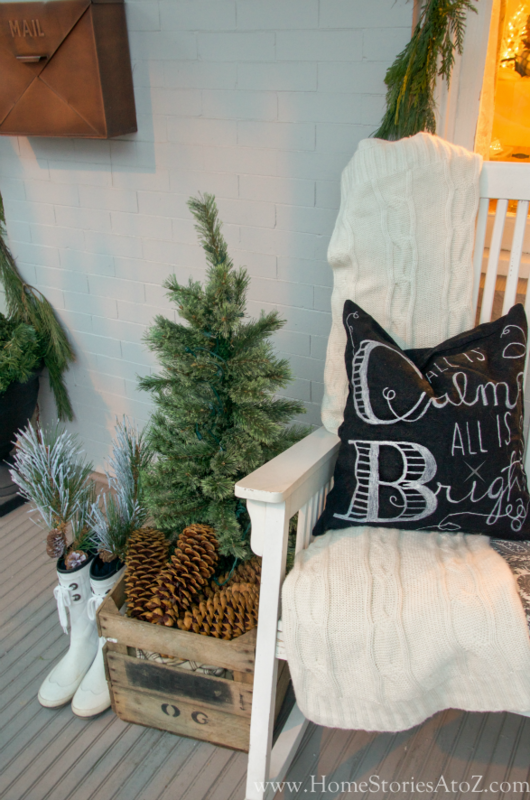 You can click the link for the tutorial on how to make your own chalkboard art pillow cover. The cable knit throw is from Target but this one on Amazon is pretty similar. My cute copper mailbox can also be found on Amazon. The pinecones are so fun and were ordered from an etsy shop. We aren’t able to find pinecones that large here on the East Coast, and I just adore the oversized ones! 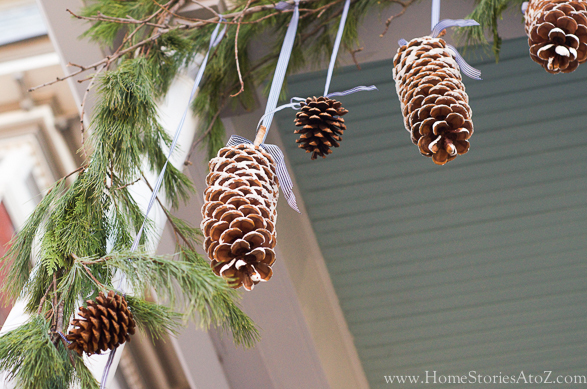 I painted the tips of the hanging-oversized pinecones white to give them a little more contrast and sparkle. 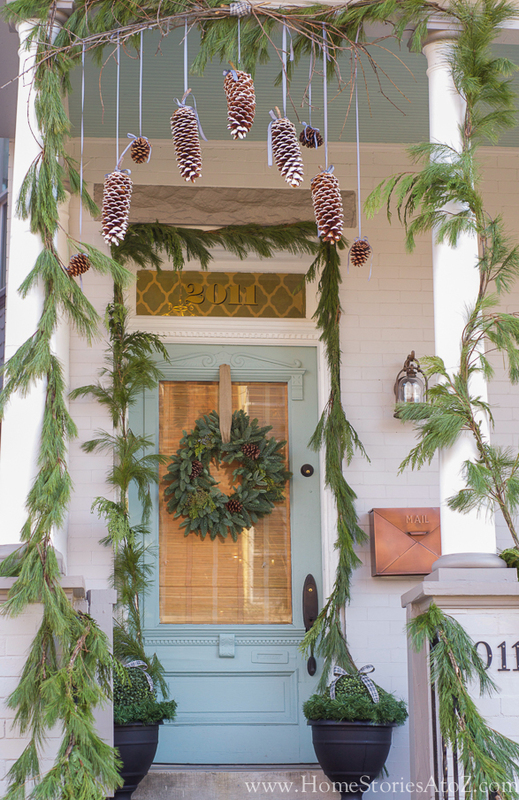 On last year’s porch, I used these branches to hold ornaments and knew that this year I wanted to mix it up with natural elements. 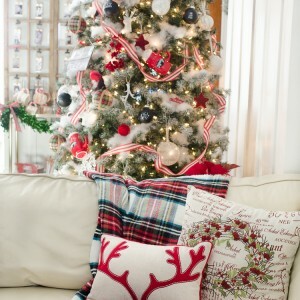 The cascading pinecones are perfect! I used floral wire around the tops of each to create a sturdy loop for the ribbons to attach to and attached each using black gingham ribbon. My urns this year were a challenge for me initially. I didn’t want to spend anymore money on decor so had to brainstorm a new way of using what I already had. 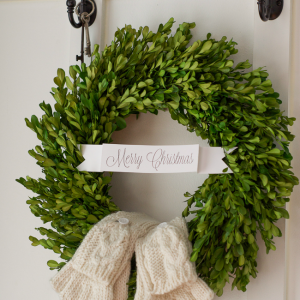 I shopped the house and found these faux wreaths and faux boxwood balls. I love this look and it was so easy to create! 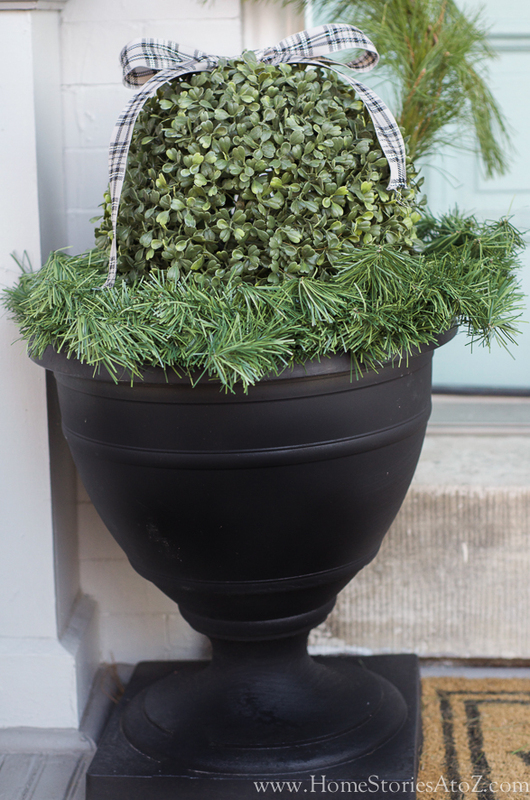 I wired a pretty plaid bow to the top of each boxwood ball and they look adorable and cost me nothing. 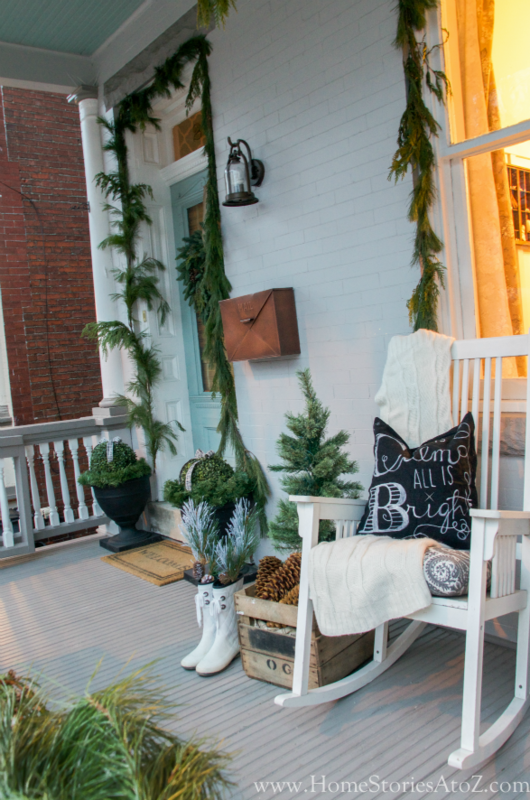 I hope you enjoyed my Christmas porch! 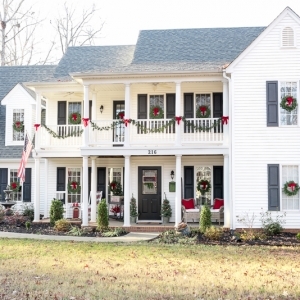 If you missed my Christmas home tour and Christmas kitchen this year, I’d love for you to click on the links to see how I decorated the inside of my home this year! 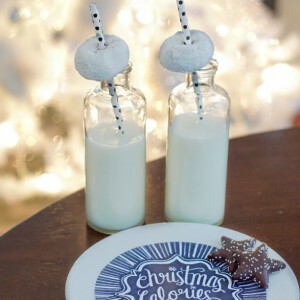 I have a bunch of simple decorating ideas waiting inside for you so come on in. Feel free to pin this picture below for later reference on any of the ideas you liked today! Wow everything is gorgeous! I am dying over your front door and we are about to renovate our house could you please please tell em where you purchased this front door. It is so beautiful!!!! Your taste is perfection. Thank you! The door is original to the house so it’s over 100 yrs old. I love it too! Your house is beautiful! 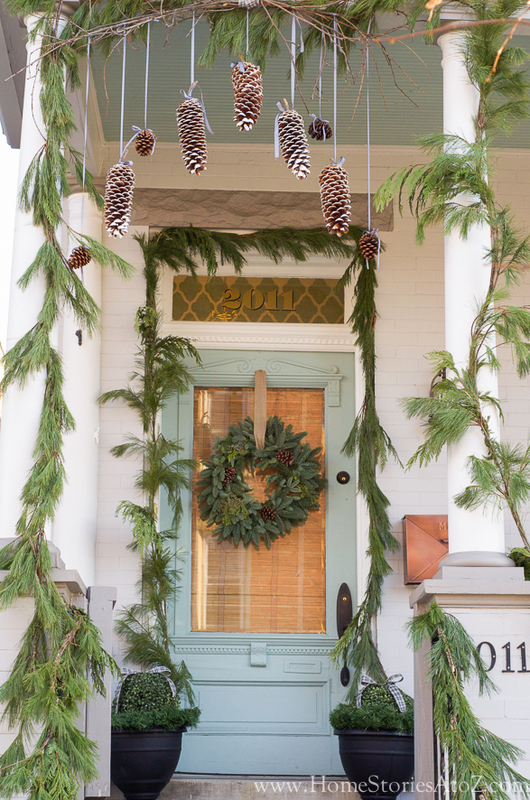 I love your porch, the pinecones add the perfect touch! 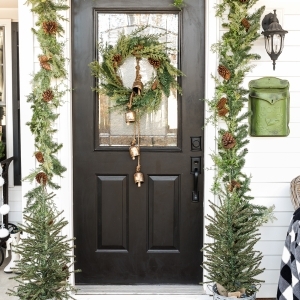 It probably smell so great with all the Christmas tree greenery….awwww my favorite part was the urn, but I just love garden urns. Real pretty !! Like walking into a forest ! Oh I love your porch. 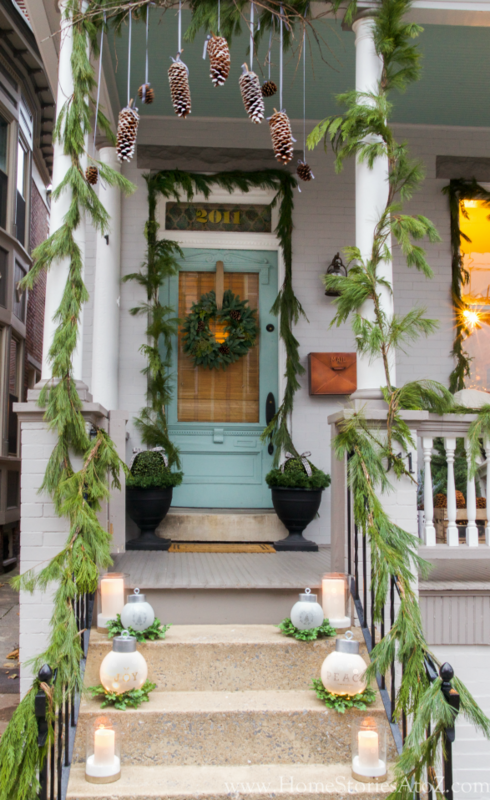 The fresh greens, love the boots and of course the fabulous lights up the steps. Gorgeous.